It has been a fractious summit, largely overshadowed by the row between Britain and the host country, Sri Lanka, over accountability for alleged war crimes committed during the country's civil war. But the closing communique agreed by the heads of government does not mention any of that, or the refusal of three Commonwealth prime ministers to come to Sri Lanka. Instead, there was a restatement of the leaders' commitment to respect, protect and promote what they call the "core values" of the organisation, including democracy, human rights and freedom of expression. 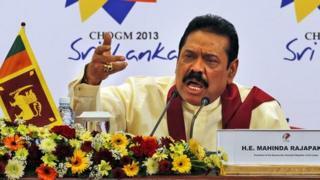 At a closing news conference, Sri Lanka's President Mahinda Rajapaksa defended his record, and insisted the country needed more time to heal the wounds of civil war. "We have to change the minds and thinking of the people, not only in the north, but in the south, too. "This is not a thing that you can start today and finish tomorrow. The war was going on for 30 years." The president has said his troops committed no abuses during or since the brutal civil war against ethnic Tamils fighting for a homeland in the island's north. But he has also said his country's institutions are actively processing mounting complaints of human rights abuse, including reports of missing people - the so-called "disappeared" - and of attacks including murders of journalists in particular and critics of government in general. Britain's Prime Minister David Cameron used this summit to set Sri Lanka a deadline of March 2014 to complete a credible independent inquiry report, or else face British pressure at the United Nations to establish an international investigation. Image caption Women in Jaffna clutch photographs of relatives they say have "disappeared"
But Mr Cameron will need support from other members of the United Nations Human Rights Council to try to force full government accountability. That support cannot be guaranteed. Mr Cameron's visit to the predominantly Tamil north of Sri Lanka on the opening day of the summit - where he was surrounded by women clutching photographs of men they say have simply "disappeared" - certainly put the issues of human rights and alleged war crimes in the international spotlight, as he had hoped. But Mr Cameron did also acknowledge there are strongly differing views about the past and that real progress, but not enough in his view, had been made in the tasks of reconciliation and investment for recovery after all the years of bloodshed. So if the summit sessions themselves did not deal with these tough and divisive issues, what did the Commonwealth leaders talk about? After all the sound and fury surrounding this summit, the agreed outcomes are mainly quiet ambitions to do better in advancing development. The 50 Commonwealth countries represented at the meeting focused their talks under the title "Growth with Equity". They agreed that eradicating poverty is the greatest challenge facing the world. A central feature is the "Colombo Declaration on Sustainable, Inclusive and Equitable Development". The Commonwealth heads note "that rising inequality at both international and national levels has implications for poverty reduction". They point out that countries grappling with natural and man-made disasters are the worst affected. They welcomed what they call "substantial progress" in meeting some of the United Nations Millennium Development Goals, but they also worry that some targets remain off-track both globally and within the Commonwealth - a club which includes both rich and poor nations, large like India and Canada, to the very tiny island states, like St Kitts and Nevis and Vanuatu. The Commonwealth heads also agreed that climate change continues to be what they call "a major challenge for all countries, posing a grave threat to some". The Commonwealth decided to hold its next summit in two years' time in Malta. It is regarded as a safe choice, tried and tested when it staged the event only eight years ago in 2005. The leaders must be hoping to avoid any repeat of the bruising disagreements within the club over the fitness of Sri Lanka as host. Defenders of the Commonwealth, led by Secretary General Kamalesh Sharma, dismiss suggestions the club of nations either looks away when bad things happen, or sweeps allegations of abuse under the carpet. Mr Sharma said at the end of this summit, or Chogm (Commonwealth Heads of Government Meeting): "The heart of the Commonwealth beats strongest at Chogm. This is why delegations and leaders convene in a spirit of mutual support and common purpose here. "Even if you did bullet points of the outcomes of the meetings you will still have to take some time. This is the genius of the Commonwealth which is always on display." His critics complain that ignores the fact that several leaders stayed away from this particular Chogm, including the prime ministers of Canada, India and Mauritius. So the large questions raised about the Commonwealth's wisdom and relevance in the modern world are still unresolved after the Sri Lanka summit.